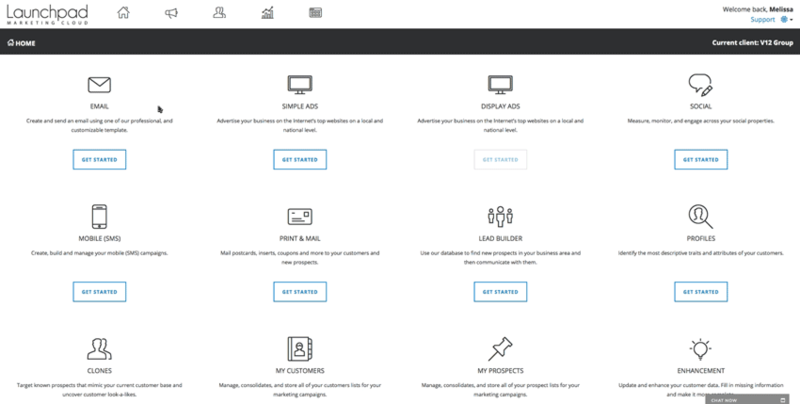 V12 Group recently redesigned their Launchpad Marketing Cloud. V12 Group Launchpad brings together several marketing solutions designed to manage existing customer relationships. It also allows marketers to identify new prospects via access to The V12 Group Data Cloud, a data source that contains more than four billion consumer, business and automotive records. • New Application Dashboard: The new Launchpad Marketing Cloud Application Dashboard offers a streamlined view of the tools and applications available to users. • Proprietary Social Management: Marketers can use the same interface to manage and monitor social media interactions on the updated social media profiles tool. The revamped social media application allows users to schedule, analyze and engage directly from the platform. • Simplified Workflow: A new, simple workflow allows users to manage customers and easily and quickly send campaigns across multiple channels. • Integrated Support Center: Launchpad Marketing Cloud online support provides users with access to the right person to answer their questions through integrated live support chat.